I have been very pleased with my years of service from a North Face Big Frog 3 man tent. I purchased this tent new in 1991. It only saw a couple of nights use each year on average. It still works well. No tears, leaks or serious mildew. (I alwas dry it thoroughly before packing it away.) All three of my sons and I fit comfortably, if snuggly, in this tent. In ’91 it was one of the lightest tents of this size. With a plastic ground sheet, its original storage sack and 7 stakes it weighs about 7.5 lbs. So, in this case, buying an expensive, fairly cutting edge tent paid off with years of service. But, I am looking for something new, and lighter in weight! Originally, I surveyed the shelter market, and decided to just keep using the Big Frog and add an ultralight 2 man tarp-tent. After all, we need to sleep five when Robin comes along. There are literally dozens of lightweight 2 man shelters out now. But then I found the Tarptent Rainshadow 2. 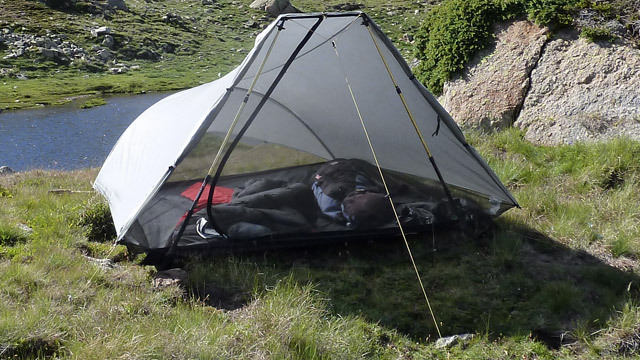 This tent is almost as big as the old Big Frog, and it reportedly weighs 47 oz, using their poles (not heavier trekking poles) and excluding a ground cloth. That is nearly half the weight of the Big Frog. Given the good reviews found by a quick Google search, I hope to purchase one of these very soon. Here is my list of shelters …some of the lightest I could find. These all have floors and bug netting. The list does not include hammocks or pure tarps. I highlighted some of the lightest per square foot as well as some good values. The prices should be current at the time of this writing. Your shelter is one of your heaviest items, along with your pack and sleeping bag/quilt, and probably your most expensive, so choose it carefully. As always, please post any questions or comments.